It now seems that what we reported some 4 months back is being verified as truth by Nissan. Sources, including some of our own, had previously let it be known that the upcoming 60-kWh Nissan LEAF would return 225-plus miles of EPA range, but it wasn't until just recently that we've been able to let loose the intel directly from Nissan. 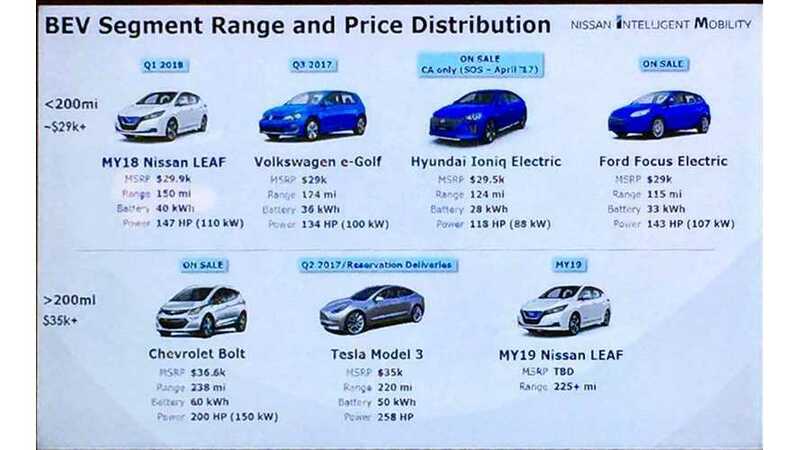 The slide above shows the automaker's intent with the 2019 LEAF. As you can see, it'll be positioned range-wise against the likes of the base Tesla Model 3 and the Chevrolet Bolt. Previously, Nissan’s executive vice president of global sales and marketing Daniele Schillaci, answered a question regarding range for the 60-kWh LEAF. His response was simply “more than 225 mile range.” He added “EPA” to that response and that's precisely what we see in the slide. As for timing for the 2019 LEAF with 225-plus miles of range, that's anyone's guess right now. It's likely a bit further out than we'd like it to be, especially when you consider that the 2018 LEAF still has yet to arrive at dealerships in the U.S.